Hi Jean, I might have been the little boy you remember in 1953(ish). The Mortimer Woolf's were distant cousins via my mother's side of my family. I was seven in 1953. I was taken round the Yeatman factory as a relative and was given a cardboard box to fill with sweets of my choice. I was also given a jar of Sunny Spread. Happy memories ! I am a beachcomber from North Norfolk and I have just found a glass bottle base with Yeatman & Co on the base. Lovely to think it may have stored sweets years ago! I worked at Yeatmans in early '60s and remember taking a little boy related to Mr Mortimer around the factory to fill a box with sweets of his choice. Mr.Mortimer, the Chairman, was highly thought of by the Sugar Girls as he made a point of talking to them when he toured the factory on his visits. Just dug up an old jar in the garden and from the markings on the bottom, and this website, have found that it was a Sunny Spread jar.... will now make a very nice vase for putting sweet peas in. I think this product was last made in the early '70's, but then came in a plastic tub with a yellow lid. just found this nostalgic site, am hooked already, wonderful memories. I loved Sunny Spread as a child , even the best honies now available can't beat the taste of it . I, too ,wish it was still here. Julian Woolf was my husband's grandfather. Robin Woolf lent us a big scrapbook of the history of Yeatman's. I found an empty jar from Sunny Spread and hope that I still have it. We also have a mirror reproduction of an add for puddings. 'We all love them.' We've never seen that reproduced in any form. The Museum of Brands and Packaging don't seem to have anything from Yeatman's. They don't have an index, the last time I asked. My husband, Inigo Woolf, can remember going around the factory and seeing the chocolates which were sold to Marks and Spencer. His father and uncle did not want to go into the family business. My grandfather (Richard James Heather known as Jim) worked for Yeatmans sweet factory when they were based on The Highway, Wapping, Stepney. He joined them after WWI, but was on the reserve list for the navy and was called-up during the Munich Crisis. He then returned to them after WWII. When the factory moved to Watford he was offered a new job there, but my grandmother did not want to leave the East End. Brenda I hope this helps you research your family, as in 1919 they were based in Tower Hamlets. Would love to know what the factory made during the war. My Great Grandfather worked for Yeatman & Co Ltd, (head office Denmark Street, London). I have in my possession letters from that company dated 1913 and 1919 my G Grandfather having been employed by them for 18 years - with an obvious break for WW1. As I am researching my family at the moment I would like to know a bit more about company that he worked for. Can anybody fill me in with any information please? Hi - does anyone have any pictures of the factory which is now Mothercare? All fascinating. A E Mortimer woolf was my great grandfather and my father always remembers going around the factory as a child and choosing bits of chocolate and all sorts to take home with him. I think they were the first people to make those circular chocolates with hundreds and thousands on them beloved by pick n mix fans! Tony if ever you didnt want your history i would be very pleased to make a donation to a charity of your choice for it as it is a bit of family history we dont have much info on. Found a jar complete with lid yesterday in buried in a hedgerow in West Devon. Net weight seven and one eighth ounces, price 10pence halfpenny. The lid is in a remarkable condition considering it has probably been buried for more than 50 years. My mother used a Sunny Spread jar as a sugar bowl in the early sixties. I just looked on this site out of nostalgia. As I used to live in Watford and well remember the factory I was most interested to find one of the old jar lids recently, buried in a ditch I was clearing out in Norfolk. The price on the lid was 1/-d. There was an empty jar with lid on e-bay recently for the princely sum of 99p. but no takers. I used to live right behind the factory as a child, in the prefab estate. I used to poke my hand through the wire grating and the men would give me handfuls of peanuts. The factory had a Hooter that sounded every now and then. When I was 3 apparently I used to fall flat on my face because the hooter frightened me so much. In my journey back in my family's history, I have discovered a connection with the Woolf family that owned Yeatman & Co. It's facinating what you turn up! 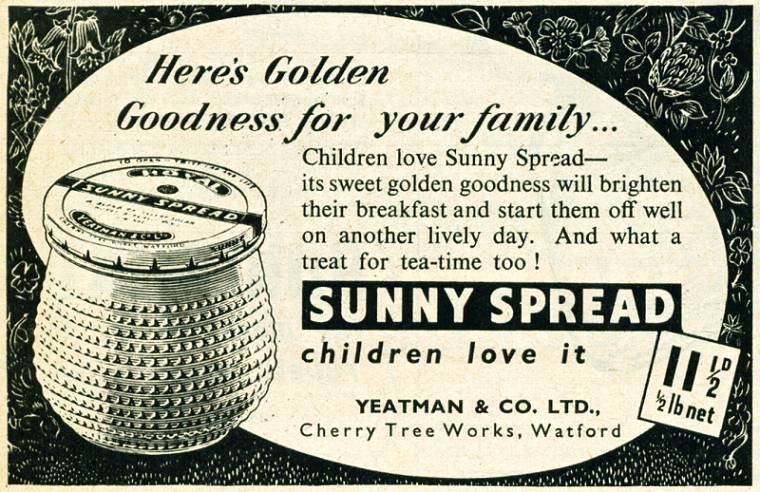 My own mother can remember the delights of Sunny Spread!! Sunny Spread was a blend of honey and invert sugar. I worked at Yeatman & Co as a buyer for 5 years. The factory closed down in about in the early 1960s and Sunny Spread production was transfred to Cars of Carlisle. The factory in Watford is still in use today and is now the head office of Mothercare. If it's the same Sunny Spread I used to have as a kid, it is a blend of honey and butter. I agreewith everything John says. Anyone know what the ingredients were? This stuff was sooooo delicious! I used to eat jars of it as a kid - why on earth did they stop making it?!! !